N.T. Wright & the Centrality of "Story"
Whether we like it or not, we are shaped by the our surroundings. The stories that we have been brought up with (Dads do this, moms to that, families do such & such, etc) shape us in such a way that they become integral to making sense of the world. In fact it is through this lens that we are (un)able incorporate new ideas into our pre-existing narratives. 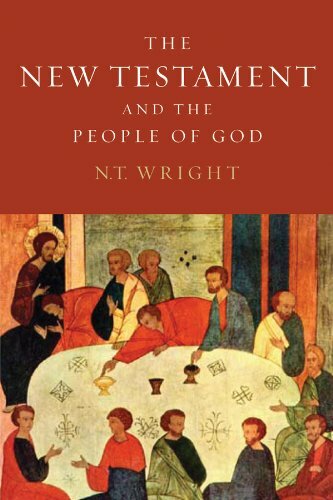 Wright continues in this vein and builds upon it by incorporating the concept of story. Wright claims that stories are too often denigrated to a menial place in the modern man's mind. Stories are second class to "abstract concepts" or "timeless truths." In Wright's estimation this is unfortunate. For him these "metaphorical lenses" through which we view the world (worldview) are ultimately made up by the idea of "story." New ideas and concepts make sense (ultimately) if they can be incorporated into the story. In short, stories are integral to our ability to make sense of the world. Without pre-existing stories a "worldview" is simply not possible. Stories come into contact with neighboring (and sometimes conflicting) stories and make sense of them by their ability to offer solutions to the "problems" in the currently held story-form. Good stories (according to Wright [an I agree]) are those stories with see the world as a place of conflict and resolution. In conclusion, Wright shows that it is stories (not abstractions) that do the real lifting in the area of "worldview" and "ideas". Most of our argumentation exists not in the form of didactic debate (although there certainly is a lot of that) but in the form of subversive stories. It is the power and persuasion of one story (not abstractions) that ultimately subvert another story and convert those who adhered to it. This last quotation to me is quite astounding when taken in light of the Gospel of Jesus. Wisdom incarnate (Jesus), spoke in parables and hid the things of the kingdom of God from the wise and revealed them to innocent babes (Luke 10). Again, as the apostles went out into the kingdom of Rome armed with the story of the Gospel their ultimate aim was a subversive one. Everywhere they went they started a riot because of the story they were telling: "Jesus is Lord, not Ceasar." & "You are now citizens of Heaven, not Rome." To us these often serve as empty words on the pages of an ancient text. In the first century these words were telling the story of a conflicting narrative to the story so many inhabited. Moreover, these words were telling the story of the emergence of a new world (the world of the New Adam) and the decaying of an old one (the world of the Old Adam). Our challenge today is to be presented with the story of the Gospel of Jesus and see how it might be subverting the stories we too are inhabiting!